Last week I was on the BIObus in several lovely Canadian parks where our team focused on aquatic collections. 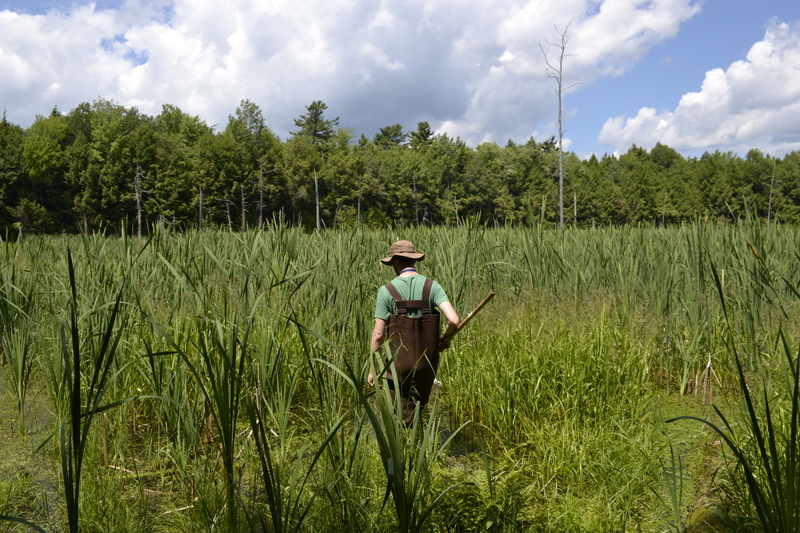 We got to tramp around in various rivers, bogs, fens, swamps and shorelines in our hip waders, scooping up bugs with our D-nets. 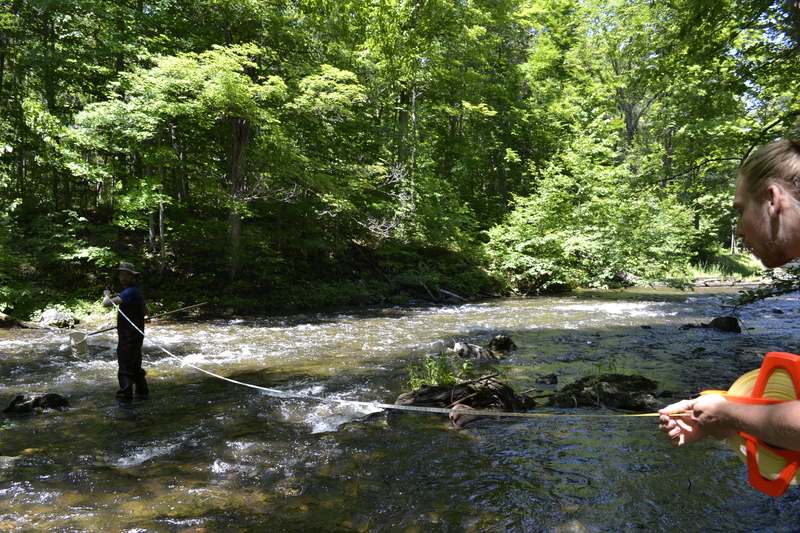 This trip, along with many others that will take place this summer, will help BIO add a new level of aquatic invertebrates to the reference library. This week I would like to talk about one site specifically; a bog off of La Rue Mills (the Mill’s road) in Thousand Islands National Park. While you may not think about it, bogs have a very complex eosystem. With light only able to penetrate a few inches into the water, the surface greenery that you see in a bog is truly only skin deep. Therefore, the most important part of a bog in my opinion is what’s underneath the surface. Bogs are formed on a thick layer of decaying plant matter that doesn’t mix a lot with the surface. This results in a nutrient rich, acidic, and anaerobic environment loaded with bacteria and low-oxygen tolerant invertebrates. This kind of anaerobic breakdown is why you get the ripe methane-and-fart scented gases associated with bogs. Such an acidic nutrient rich soup is perfect for any photosynthetic organism that can reach the sunlight. This is why bogs are usually covered in surface plants such as sphagnum moss or tall root-mat forming macrophytes, like the bog I waded through. While reaching less than a meter deep, the bog was pretty treacherous! The wide system of roots sent out by the surface plants to collect nutrients wove together in such a way as to create an expansive thick mat floating on about a foot of water. Trudging through it was sort of like wading through a huge pool of ground beef. I almost fell in a couple of times, but luckily the mat was thick enough for me to kneel upon when I did start to topple in slow motion. Everything is slow motion in hip waders, you see, much like being an astronaut. 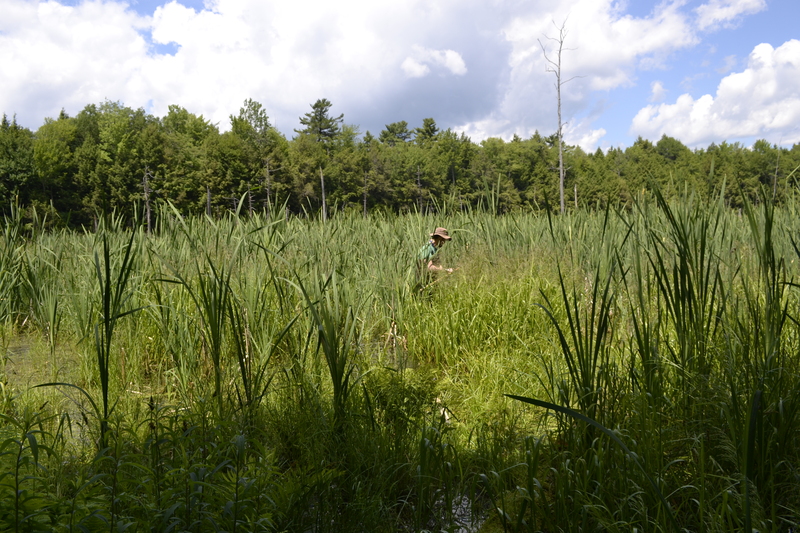 Sampling the bog was pretty interesting; if you skim the surface you can collect a wide assortment of macroinvertebrates, like giant water bugs and dragonfly larvae. But if you stick the net in more than than a few inches, all you collect is anoxic, mostly macroinvertebrate free brown bog muck. It’s an interesting ecosystem with well-defined layers based almost solely on the amount of available light and oxygen. 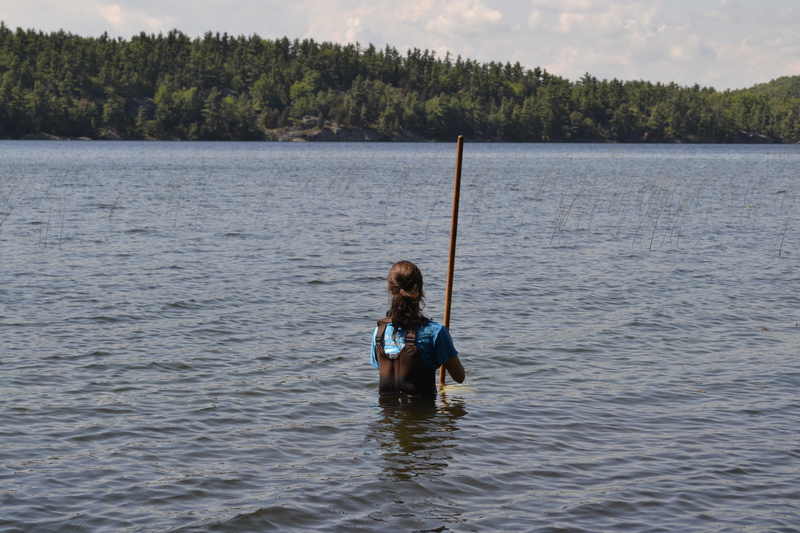 After taking a few representitive samples, I flopped back to shore and helped Dan collect some of the rich above-bog diversity. 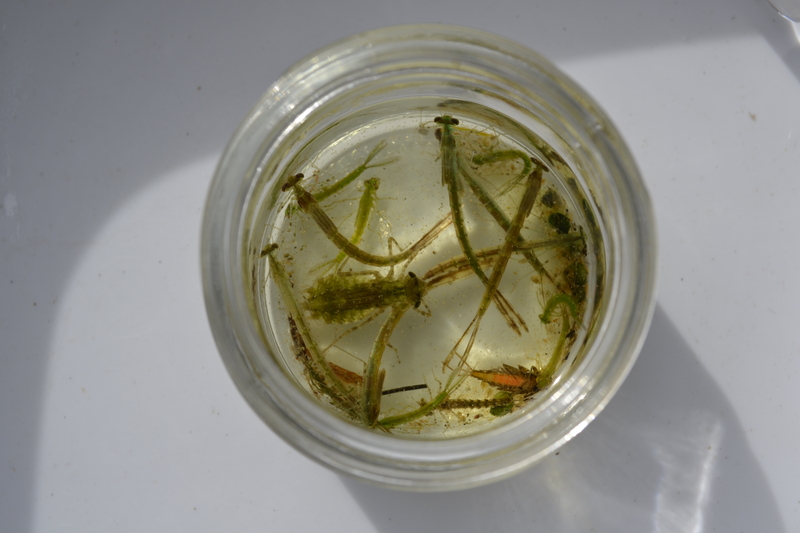 The huge nutrient uptake from the macrophytes are able to support a diverse and well populated invertebrate community on the surface. 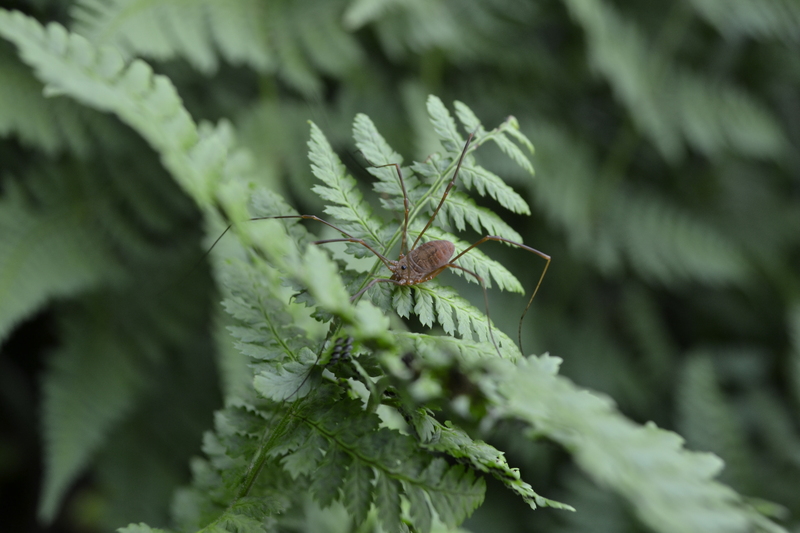 So we were collecting things like grasshoppers, field crickets and harvestmen all running around on the top of the bog, which was pretty cool. So remember, if you see a bog or wetland don’t think about it as a waste of space; remember that it is a multifaceted ecosystem teeming with life held in balance between nutrients and light. Oh, and they are really good at filtering all of our wastewater, too. Until next time, bug people!